(2 Pack) – Jason Bodycare – Vitamin E Oil 45000 Iu | 60ml | 2 PACK BUNDLE. Jason Bodycare-Vitamin E Oil 45000 Iu (60ml)JĀSÖN® Vitamin E Oil 45,000 IU is a Maximum Strength facial treatment that combines Vitamin E Oil with our exclusive blend of 7 essential natural oils, including Black Current, Evening Primrose, Macadamia Nut and Borage. Use at night to help reduce the appearance of fine line and wrinkles. 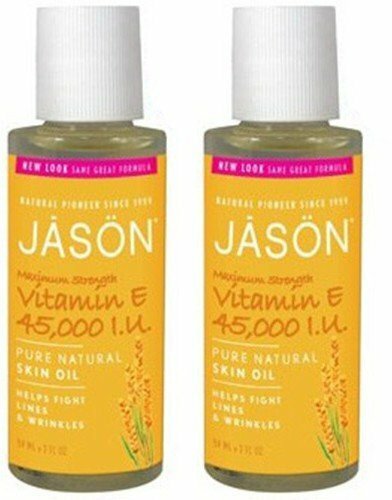 Great Deals & Offers On Jason Bodycare – Vitamin E Oil 45000 Iu – 60ml . FREE Delivery On ALL Items.